At St. Mary, we strive to provide the best possible religious education for our parish community. Together, our programs work as a resource, preparing our children, young adults, and adults for the sacraments and continuing to nourish our communities’ faith formation. The Parish Council Education Committee Chair is Sr. Susan Louise Eder, OSFS, principal@holycrossweb.com and is moderated by Fr. John Mosimann. Watch the bulletin and join us in the coming year for a Bible Study of the Acts of the Apostles, Women’s Walking with Purpose will continue for current and new students, The Catholic Divorce Survival Guide class, a new Fr. Barron class on the Mystery of God: Who God Is and Why He Matters, several one-day classes on topics of interest such as Life Decisions and Annulment and much more. Mission: To assist in our children’s faith formation. There is a large range of responsibilities undertaken by the parish in serving over 1,200 children in their faith formation and sacramental preparation. Time: Weekly commitment (if possible), plus initial training, including VIRTUS and on-going formation as needed. As much or as little time as you can give is deeply appreciated. Talent: A love of faith and children is foremost, and a desire to fill a needed role in an environment where Christ is our focus. Training and certification are made available to all to ensure that we are educated in the faith we teach. Volunteer opportunities include; catechists/teachers, teacher aides, prayer aides, child care providers, office and clerical volunteers. As a school community this past year, we joined the parish in focusing on recognizing God’s gifts in our lives and learning how to use them for his service and the good of those around us. It has been a great blessing to see our children grow in their awareness of the Spirit working through them and in them. It also has afforded us the opportunity to discuss with our students what a blessing it is to use these gifts in a life dedicated totally to God’s service. It is our prayer that many priestly and religious vocations have been awakened in the souls of our children this year. A major goal that was accomplished this year was the implementation of our new Math program in Focus. we are pleased with results and the increased mathematical understanding of our students. As we continue to implement this program, we are confident that we will all grow mathematically and intellectually. The best result of all is that our teachers have seen an increase in our students’ critical thinking and reasoning skills. In addition to these two major goals, we accomplished several other notable items. We increased our work on research with our 7th & 8th graders. we also completed our parking lot project, right down to the landscaping. We are thrilled with the new dismissal procedures. We also added additional security features in our classrooms and outside. Our school and parish community continues to support our Oblate Sisters’ Missions with great generosity and love. This has allowed our Sisters to complete the construction of their new covenant in Pella, South Africa. This spot is very important to our Oblate missions since it was our first Mission foundation. We continue to emphasize the importance of service to those near and far with our children. This coming school year we will be going through the process of an extensive self-study. the Design for Excellence (DFE). We will host a visiting team in March and they will verify our self-study and assist us in planning for the future. This year will also see our school auction. The plans are all coming together under the theme: “There’s No Place Like HCA – A Road to Knowledge, Courage and Heart”. 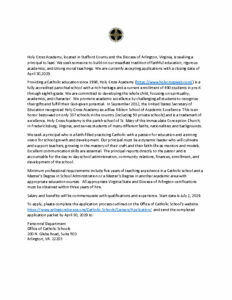 Mission: To provide support for the Catholic education of our children. Time: Weekly commitment (if possible), plus initial training, including VIRTUS and on-going formation, as needed. As much or as little time as you can give is deeply appreciated. Talent: A love of education and children is foremost and a desire to fill a needed role in an environment where Christ is our focus. A full spectrum of opportunities are available. We are blessed with a faithful formation team for adults who are seeking to live the faith, toward the ultimate goal of full sacramental initiation in the Church at the Easter Vigil Mass. Mission: To facilitate the process of initiating new members into our Roman Catholic community of faith through Baptism, Confirmation and Eucharist. Providing personal presence which seeks to accompany Inquirers throughout the process of coming to the Sacraments. Time: Mondays 7:30-8:15pm, then small group discussion after snacks 8:30-9:15pm; weekly meetings and some other weekend activities, planning meetings. Talent: An ability to share your love of Christ and the Catholic faith with those seeking to become Catholic. Some teaching and leading of discussion groups is possible, along with priests and other faculty. Talent: A love for young children. Must be energetic, loving and kind-spirited. Teachers, aides and caregivers needed. Mission: Our primary mission as a Youth Ministry program is to bring young people into an intimate, personal relationship with Jesus Christ and His Church. We believe that lives are transformed when young people are invited to encounter, connect and grow in their relationship with God. Some of the organizations that benefitted from our ministry are: Greenfields nursing home, MICAH Ecumenical Ministries, Mary’s Shelter, Woodmont Nursing Home, Catholic Charities Migration and Resettlement Services, and St. Vincent de Paul. Several opportunities to serve our youth are listed below. Coordinator: Leo Chavarria, Director of Youth Ministry, leo@stmaryfred.org. Note: The Diocese mandates that all CYM adult volunteers (18+ years of age) be compliant with OPCYP Programs. Contact Leo Chavarria for more information. We have over 200 8th grade youth receiving Confirmation this year and a new group of rising 7th graders that need to be formed into teams. Mission: To serve as a team leader to 7-10 seventh and eighth graders who are preparing for the sacrament of Confirmation. Leaders serve as spiritual mentors and coordinators of spiritual works mercy service projects which lead candidates into serving in the life of the Church, reflect on their involvement and connect. Loving adults are needed to witness their faith and commitment to the Church and inspire our young people to grow in their faith. Time: 15-18 month commitment. Monthly meetings with team members to complete spiritual and corporal works of mercy and accompany youth to the Confirmation retreat. Several formation meetings with staff and other Team Leaders. Talent: An ability to act as a mentor, witnessing your love of God and our life in the church. Able to share freely and appropriately, and inspire faith. We average 50-60 youth at each of our Sunday night meetings and about 20 of our youth participate in our Wednesday night YOUCAT study. Our high school work camp numbers about 40 youth. Mission: To engage young people in their faith, the Church, and current issues occurring in their lives through small group discussions and speakers. Time: Meetings held Sundays after 5pm Mass and other activities as planned. Mission: To engage young people in discussing topics about their faith, the Church, and current issues occurring in their lives through small group discussions and speakers. 7th-8th grade boys and girls welcome. Time: Select Sundays 3:30-4:30pm (see youth calendar). Mission: To assist in the preparation, coordination and participation of our youth’s WorkCamp experiences. Time: Varies based on area of support. Can include volunteering the week of camp, weekend fundraising activities or planning meetings. Talent: Many opportunities are available such as: contractor, team leader, fundraising coordinator, stakeholder, security, lunch prep, etc. All share in the coordination and execution of a powerful week long service oriented WorkCamp experience. Volunteers are needed to attend WorkCamp and provide leadership. Always in need of a contractor or someone who is very handy. the Diocese requires that each parish have one or two contractors attend WorkCamp-we need you! No experience necessary but a willingness to witness Christ through your example to our youth is a must. Mission: To help with the faith and personal development of young people. Moderating small group discussions, chaperoning/assisting with retreats, helping prepare/serve Sunday Night Youth Dinner etc. Time: Weekly High School night is Sunday, following the 5pm Mass, as well as activities during the week. A weekly commitment is desired but any time is appreciated. Talent: Capacity to build community by inspiring youth to be involved. Specific talents are welcome, not required.